Letters, letters, letters – you’ve got sales questions, Jeff has sales answers. With more than 30 years of sales experience, Jeff understands the issues that sales professionals face. In today’s Episode of The Buyer’s Mind Jeff answers 5 questions that are on your minds. [0:56] How can I stand apart from the crowd? [5:44] What is the No. 1 attribute of a great salesperson? [7:33] What are the most important questions to ask in the sales process? [12:34] How do I balance quotas with selling in my customer’s best interest? [17:47] Why do my customer’s always say – I want to think about it? As an in-demand sales keynote speaker, author and trainer for over three decades, Jeff has a unique ability to connect with audiences on a personal level and transform the way they look at what they do, inspiring meaningful and lasting change. In a crowded field of sales keynote speakers and sales training programs, Jeff Shore stands out with his research-based “buying formula” methodology. 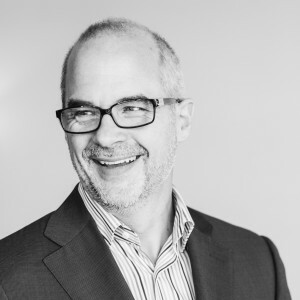 Combining his extensive front-line sales experience with the latest leading-edge research into buyer psychology, Jeff has created a highly effective, personalized way to reset sales paradigms and deliver industry-leading results. 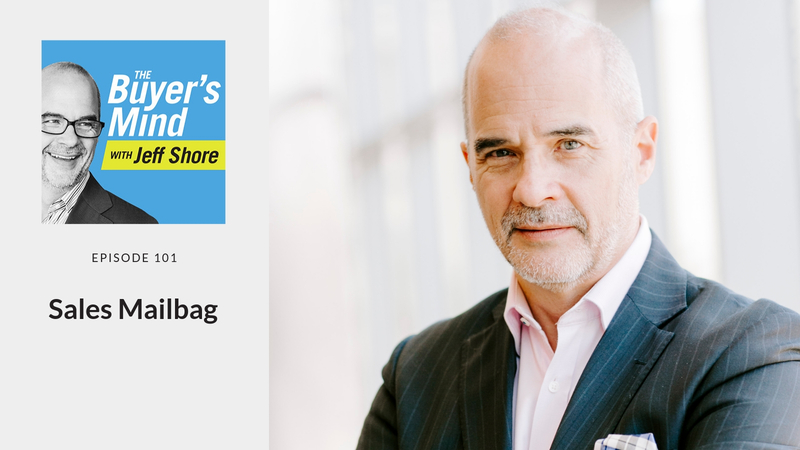 Jeff: It’s time to open up the mailbag on today’s episode of The Buyers’ Mind. Man: Welcome to The Buyers’ Mind where we take a closer look deep inside your customers’ decision-making mechanisms to reverse engineer the perfect sales presentation. Now, please welcome your host, Jeff Shore. Jeff: Well, welcome everyone, once again to The Buyers’ Mind the podcast where we try to understand what our customers are thinking so we can reverse engineer that sales presentation, make it easy for them to do what they already wanna do. They wanna buy, right? And today is a special episode. We do this from time to time, but our show producer, Paul Murphy has picked out questions from our listening audience, and I’m gonna answer those questions that you have asked. So, Murph, welcome as always and let’s just dive right into it. What are people asking? Paul: All right, here we go, Jeff. So, here’s the question number one, I feel like customers view salespeople the same way and it’s usually not good. How can I stand apart from the crowd? Jeff: Yeah, you know there is a bias out there that we see, it’s not so much a bias as it is a heuristic, a set of mental guidelines that people carry around with them and it helps them, their decision-making process. So they are in a sense biases and they walk through the door with an idea of what a salesperson is or what they fear a salesperson might be. And that might be based on their own experience, it might be based on what they’ve seen in the media or movies or television. Their picture of a salesperson might be that, you know, that cheesy salesperson with the plaid jacket and a white shoes and the, you know, medallion and the chest hair and all of that. Or maybe it’s just a super, super slick, it’s the Leonardo DiCaprio selling garbage bonds or stocks or Alec Baldwin yelling, you know, always be closing. So, people carry around these biases with them, and when they walk through the door in the first place, there could be a little bit of that guard up because of either their experience or their impressions. It’s not that these are mean people, it’s not that they are just generally as the way that they live their life, skeptical and cynical and I mean, I look at myself, I’m going to admit it. I’m a nicer guy when I walk into a cocktail party than I do when I walk onto a car lot, right? And my guard is up and I just think it’s a natural behavior. I think the great salespeople out there, the ones who understand that, they don’t make moral judgments about the way that their customer’s behaving. They understand that there is a message that that customer is setting and the message is that they’re a little afraid, that there is fear there. So, it is the salesperson’s, the sales professional’s obligation and responsibility to own that. It’s not about saying, “What’s wrong with this guy?” It’s a matter of owning that and recognizing that that trust, that relationship, that connection, none of these things can be assumed, nobody owes us anything, when that customer first walks through the door. This is all the work that we have to do. But here’s the good news, when we are fully engaged, when we are our best selves even for those first few seconds, if we are 100% connected and committed, it’ll make a huge difference, because so much of what we communicate about ourselves, about our environment, about the energy is simply the way that we carry ourselves. It’s our facial posture, it’s the light of the eyes, it’s those things that say, “I’m a good person here.” It’s not faking it, it’s not a matter of you know, I’m gonna pretend like I like you, that does not work. We got to look at it and say, “How can I be my best of self, the best version of me possible for the person who was just walking through the door, and when I do that, the customer picks up on it. Now, if that customer is still a little bit wary, a little bit defensive, I would suggest the decision that you made to be your best self is a unilateral decision. That is, you made it without thinking about what the customer’s response or attitude is going to be. So, if it’s a unilateral decision, that means that your decision was made apart from the customer’s actions or behaviors. So, even if the customer is resistant, snarky, negative, whatever it is, it only means that there is more fear there that still needs to be dealt with. But we have to make that decision that I’m not going to allow that to take me down. Because if I allow a customer’s snarkiness or negative attitude or whatever it is to drag me down, then I’m in the victim role. I do my customer no favors whatsoever when I adopt their negative energy. I have to make a decision to outlast whatever that customer is gonna bring me and here’s the good news. When you do that, when you bring that person around, that will be your best customer because you are willing to go places where other salespeople are simply not, and you’ll have a connection with that customer that other salespeople will never have. Paul: And we talked about that in the past, the fact that if somebody comes in with a negative attitude, if you have a negative attitude, how do you make that a win-win situation? It’s impossible. But like you said, you need to outlast them. Jeff: Yes. And if you’re positive and they’re positive, then you both win. I think that’s the critical issue here, it’s not that you win and they lose, its when you’re positive and you can bring them positive, that’s where the win-win takes place. Paul: There we go. So, question number two, and I think I might know the answer to this, but you’re gonna have to check me if I’m wrong. And that is what is the number one attribute of a great salesperson And I’m going to say it’s insane curiosity. Jeff: Well, I’m gonna disagree with you. Look, I think…and I’ll tell you why and it’s a question of semantics. I would say that insane curiosity is the number one skill set of a great salesperson. But if the question is attribute, that’s more about something that I just sort of carry around inside, it’s a part of my person, it’s a part of my character, whereas insane curiosity, that is a skill, it can be developed. And so, I would look at curiosity as a very, very important skill set but when it comes to attribute, I would say the number one attribute would be achievement drive. Great salespeople have to win, they have to. It drives them crazy when they are not successful, when they are not performing. So, you know, I always suggest to sales managers that they’re thinking through what does the top salesperson look like? What are those key attributes? And in order, I list them as achievement drive is number one. Number two is positive energy, because I can’t teach that, you have it or you don’t. I might be able to tweak that a little bit but if you’re not a positive energy person, I can’t help you. And then number three is coachability, the desire to learn, the desire to grow. So, those are those three attributes. Now, if we’re looking at skill sets that I’m gonna agree with you, I’m gonna say insane curiosity. Paul: The question was attribute so I bow to the master, I bow to the master. All right, question number three, what are the most important questions to ask in the sales process? Jeff: Oh, boy, that’s a big question because when I think about the most important questions to ask, I think about it from the perspective that there is nothing that a sales professional will do that will help their presentation more than to focus and study the questions that they are asking. Great salespeople aren’t great because they have all the answers. Great salespeople are great because they ask the right questions and I think we have to be consumed with asking great questions. I think a great question is like a paintbrush in the hands of an artist who’s painting a true masterpiece. There are okay questions, there are good questions and there are great questions. I think we have to be consumed with great questions because that’s the great questions that really help us to learn what it is that we need to learn from our customer, it helps our customer to connect with us. Because if you’re asking a question that is generating an I’m just looking, then I would ask a different question. We ought to be able to constantly test the quality of our questions based on the quality of the responses. All right now, go back and reread that question to make sure that I have it exactly right there, Murph. Paul: What are the most important questions to ask in the sales process? Jeff: All right, so I think if I was going to look at the single most important question to ask, it would be the motivation question. Why are you thinking this might be good for you? Why are you thinking? Why are you shopping for this? It’s anything that leads me to the back story and that is that most salespeople are so consumed with what a customer is moving to that they fail to understand what a customer is coming from. And I want to know what happened before you got here. What is going on in your world? So, if I look at an example of that, you know, just look at something like shopping for we could say anything, we’ll just say pillows. Somebody’s out shopping for a pillow and I am in Pillows ‘R Us, right? I’m a pillow salesperson, I’m one of the greatest pillow salespeople in the world. Now, I got tons of pillows, I got fat, I’ve got thin, I’ve got memory foam, I’ve got feather, I got anything you want in a pillow. So, I could if I chose to look at it and say, “Do you like this one? Do you like this one? Do you like this one?” Those are not good questions. What I wanna know is, why did you feel the need to walk into my pillow store? Why did you feel the need to walk into my pillow store? That’s the only thing that really matters here is to understand the reason that they are there in the first place. And when you think about it, something’s going on, something’s going on. Maybe it’s a splurge. Maybe they just felt like, “I wanna take care of myself and I wanna good pillow” or maybe they woke up with a sore neck or maybe they…something happened, their dog jumped up on the bed and shredded their pillow. I don’t know what it is, but if I can figure out what they’re coming from, it will guide the questions of where they are moving to. So, I would say that the most important question in all of sales is that initial motivation question. However you ask the question is gonna be up to you, it’s gonna be situational, but what you’re trying to figure out is, why are you here? Now the second most important question then would be, would you like to buy it? It’ll be that final close, the ask for the sale in a way that’s simple, natural, conversational and a normal extension of everything that has been spoken about in between. So, if you think about your sales presentation as bookends, the open…the bookend as you open is the motivation question, why are you thinking about moving. The bookend at the finish is that closing question, would you like to make this yours or however you want to ask that, but to me those are the two most important questions in sales. Paul: All right, question number four, I’m not sure, this could be somebody who’s selling cars, could be anything I guess. But the question is, how do I balance meeting quotas and still selling with the customer’s best interest in mind? Jeff: Well that’s an interesting question and it’s something that I think everybody has to consider and deal with and sort of work through, chop through in their own mind. The fact of the matter is that business plans are real things, that companies exist on business plans, that they do tend to look at it and say, “How do I,” as a business leader, as a company owner, whatever it is, “how do I meet my goals for the organization?” And because sales is the lifeblood, if you have no revenue, you have no organization because sales is the lifeblood. Yes, there is going to be a business plan and that is going to be associated with quota. So, that is a business reality that I don’t really think that we can get around. But the question is how do I justify the quotas against working in my customers’ best interest? And the application in the question is that those two things are exclusive, that is I can work to get the quota filled or I can work in my customers’ best interest and I just don’t think that’s the case. I like to think that if I am working in my customers’ best interest, that if I am really understanding who it is they are and why my solution is the best for them, I’ll make my quotas, I will make my quotas if I can get this all figured out. Now, there’s a big caveat in there and I wanna open up that can of worms here just a little bit, because what I just said is that if I believe that my solution is the best for that customer, well, that could be a big if. And I think that that’s the dividing line, for people who are quoted driven only, they don’t really care whether their solution is the best for the customer. What they care about is whether they can get the customer to buy their product and it’s just not a game that I wanna play, it’s not a part of who I want to become. Now that doesn’t mean that my product is perfect for this customer but I still want to be able to show them how my product can help this customer. Now, if the customer deems that the product can’t help them, or that another product can help them substantially more, that’s the decision that they are going to have to make. So, I still have a responsibility to the product, to the organization, and to my customer to show them the ways that this will benefit them, that this will be a good solution for them. But ultimately, if it’s not a good solution for them, I can’t fight that. So, I wanna be able to look at it from the perspective that if you are putting your customer first, if you are showing them very specifically how your product can really help them, then at the end of the day, they will make the decision with your persuasion, with your influence, yes, but ultimately they will make the decision as to whether this makes sense for them. So, I’ll just give you an example. I’m actually building in my house, I’ve got a big storage space in my house and I’ve moved most of the stuff out of the storage space and put it in the garage and I’m building a hockey training room. Well, part of that means that I’ve got to determine what kind of floor I want and there are two choices that I have. One are called stick handling tiles, they’re a slick, hard plastic, where you can just stick handle with the puck and shoot the puck. The other is synthetic ice where you can actually put on a pair of skates, ice skates and skate as if you were on the ice. Well, this synthetic, guys, is dramatically more expensive. But I was talking to a salesperson, he told me all about the benefits that I’m going to get and how it’s going to be, you know, so much…so helpful to me in the sense that I get that real experience of being on my skates while I’m practicing. And he was passionate about it. He was enthusiastic about it and at the end of the day I had to look at it and say, you know what, I spent a lot of time on the ice already. What I really want this for is not for my skating skills, I want to use this for my puck handling and shooting skills and because of that, I don’t need to spend what will end up being five times as much for that different type of service. Now, the salesperson did a great job, his influence was strong, his passion was high, I think he did his job very, very well. At the end of the day, I made the decision as to what was best for me and he did not get the sale, but he still did his job. So, we’ve got to be able to look at it and say, if the behaviors are right, if we’re doing the things that you’re supposed to do, the quota will get filled. Now, if the behaviors are right, and the quota is not getting filled, well, then you got a value problem. And that’s a different situation that is separate from the performance of the salesperson. Jeff: Did customers say that? Did customers say, “I want to think about it?” I’ve never heard that before, Murph. Paul: I’ve said it a few times myself. Jeff: Exactly. You know what? It’s one of those things where it’s really frustrating, right, for sales professionals to hear a customer say, “I wanna think about it.” You’ve just spent 30 minutes, 60, 90, maybe 2 weeks, maybe 2 months with this customer and now they say, “I want to think about it.” And it’s infuriating, right? Because you think, “Why would you possibly want to think about it? It’s perfect for you.” And I think there is one key reason why a customer says I want to think about it. And just to be clear on this, I don’t think it’s code word, I don’t think it’s a customer playing games with us, I don’t think it’s a customer who’s being elusive. I think the customer really does legitimately mean by that, I wanna think about it. The question is why? Why do they feel the need to process even more? And the answer to that question comes in the form of the idea that the sales process or the purchase process, the buying process is not one decision, it’s actually a series of decisions. So you can pick any product that you want, let’s go back to pillows here since we used that example earlier. It seems like a fairly simple decision, right? A pillow. Except when you think about all the small decisions that go into it and then give it a little thought. Just chop that up for a little bit. I haven’t bought a pillow in a long time but I’m just thinking as a consumer right now, what are the decisions that I have to make. Okay? Here’s a list, what kind of pillow or pillows have I had in the past? What pillows have been comfortable and what pillows have not? When I’m in a hotel room as I am often, what type of pillow do I enjoy? What kind of pillow do I hate? How much does a pillow cost? How much do I want to spend for a pillow? What do the experts say? Are the review sites specifically for pillows? Why am I thinking I want to buy a pillow in the first place? Is this a neck issue? Do I sleep on my back, on my stomach or on my side? I mean, listen, these are all decisions that I have to make over something as simple as a pillow and I could go on. The problem that we run up against it’s, and I believe that this is the fault of salespeople, quite frankly, is that salespeople think that the closing question is this one question that you asked at the very end, what do you think? Would you like to buy this pillow? The issue that we have there for a customer is that if that customer has not been making decisions all throughout the process, then all of those mini decisions now have to bubble up into one final decision. Now, that might be possible with a pillow but it’s far more complex if you have a more complex product. Say you’re selling cars or homes or life insurance products or something that is a more difficult consideration. So, the salesperson who fails to gain small agreements throughout the process, you’ve all been told, if you’re a salesperson you’ve all been told, do the soft closes, do the soft closes. Yeah, you should but the question is why? I think we’ve been sold a bill of goods by sales trainers that’s say, you’re supposed to do the soft closes for you so that you know where the customer is at, that’s wrong. You don’t close for you, you close for them, you close so that they know where they are at, because every small decision, every time they make a small decision, that decision becomes real. It becomes conscious and it becomes memorable. So, now when it’s time to make my big decision, I can simply look back at all of my small decisions and then ask myself does that make sense? All the small decisions bubble up into that big decision and that’s when it’s easy to buy. So, if we’ve not been asking our customers these agreement questions all throughout the process, now we’re saying, “What do you think? Would you like to buy it?” They’re gonna to try very quickly to process everything you’ve been talking about but in the absence of any small decisions. And you know what they’re gonna say? They’re gonna say, “I need to think about it” and they’re not lying. They do need to think about it and if you say to them, as you’ve been taught in training classes, “Well, what do you need to think about?” You know, what they’re gonna say? They’re going to say, “Well, I need to think about what I need to think about.” It’s true, they need to go back and reprocess everything you’ve spoken of. So, if you want to get away from the, ‘I wanna think about it,” the answer is very simple. It’s a critical habit, you have to get your customer making small decisions all throughout the process. Paul: Well, Jeff, that’s all that we have in the mailbag, but I would also make the suggestion that If you’re wondering about the “I want to think about it” question, we do have a podcast on that number 33 with Amy O’Connor, who’s on our short consulting team. So, I’d encourage you to take a listen to that as well and I appreciate it. If you have other questions that you wanna send into us, I would love to get them in front of Jeff. If you wouldn’t mind writing to us at ask@jeffshore.com. That’s A-S-K @jeffshore. com. We will be happy to include that in the next time we have a mailbag, which will be the fifth week of every month that we have that opportunity. We’re gonna try and open the mailbag on a regular basis to get your questions answered. Thanks for tuning in and we hope that you’ll go out there and change somebody’s world.